Why does RBI Sell Bonds, Like It Has Done Today? RBI is doing an OMO sale of government bonds today, and has sold Rs. 8270 cr. worth bonds. This is a good question. Why does RBI sell bonds? Who gets the money? Sure, RBI sells government bonds (as a merchant banker) on every Friday. That’s when the government gets money. A lot of it. 15,000 cr. will be sold just this Friday. But that’s not the same thing as this OMO sale. When the government sells bonds, the RBI is just a banker, organizing the sale through an auction. But RBI also owns some government bonds on its own. RBI is a separate entity and has its own balance sheet, and on that, it owns assets like dollar reserves, rupee bonds etc. It doesn’t buy them from the government (it’s not allowed to) but it buys them from the market, as purchase operations. It has done this consistently in the past, buying bonds on the market as required. When it does so, it prints rupees and buys them. This increases the supply of rupees, and a higher supply of rupees will stoke inflation. It also prints money to buy dollars and both the purchases are inherently inflationary. Inflation lags an increase in the balance sheet, but Balance Sheet increases aren’t the only reason for inflation (which could be food related also). But if you keep increasing the money supply when inflationary pressures are high, you will definitely cause inflation. To stop this, over the last few years, Rajan has been buying dollars (to build up forex reserves) but at the same time sold a lot of rupee bonds to reduce balance sheet growth which had gone berserk. 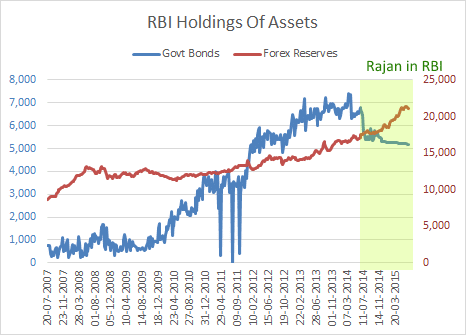 As you can see, the RBI has been cutting down bonds while buying forex to keep the balance sheet size in check. Growth of the balance sheet has been of the order of 10% lately, but it did spike up earlier to 13% a month back. But Doesn’t This Hurt Banks? Banks borrow overnight from the RBI. In recent times, they have been keeping money WITH the RBI. Because they have too much money and they can’t seem to be able to lend it out. This results in “temporary” crunching of the balance sheet, but then the banks get the money back the next day. With the RBI now selling their bonds, banks will get the bonds and pay for them with rupees. This will make it “permanent” and that much money (rupees) goes back to the RBI and gets extinguished. This reduces money supply. It doesn’t hurt banks precisely because the system liquidity was too high, and banks were parking money overnight with the RBI. If the liquidity situation was the other way (i.e. banks were borrowing from the RBI overnight) then such a move would have hurt banks. 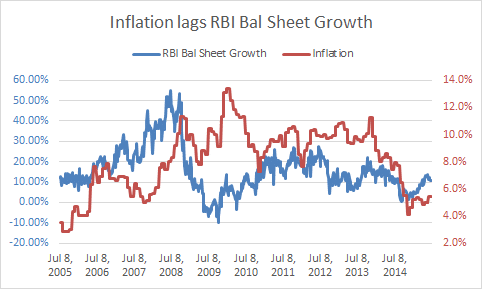 Given what RBI is selling it has emerged that bond yields have gone up, in the fear of new supply. This is probably more a short-term thing, and unless RBI does this sort of thing every week, we should expect bond yields to go back to their original rates. Overall, when RBI sells bonds, expect liquidity in rupee terms to go down. When they buy bonds or forex, liquidity in rupee terms goes up. Effectively the RBI balance sheet contracts and expands respectively. When RBI sells bonds it will temporarily hurt bond prices (which are sold in anticipation of greater supply) and when they buy bonds, prices go up. Yields behave inversely to prices. This is just a post to explain the concept. There should be no real large impact.